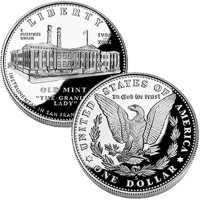 The 2006-S San Francisco Old Mint Commemorative Proof Silver Dollar was struck by the US Mint to celebrate the 100th anniversary of the Old Mint building’s survival of the San Francisco earthquakes and fire of 1906. The Old Mint building was constructed in the 1870′s under the direction of Alfred Bult Mullett, Supervising Architect of the Treasury Department. He believed that the building should be constructed to survive an earthquake, and took steps to insure it was. His foresight proved accurate when most of the commercial district of San Francisco laid in ruins after the earthquakes of 1906. However, the Old Mint building (nicknamed the "Granite Lady") survived and ending up serving as the depository and treasury for the city’s relief fund. Surcharges were added to the sale of each of these coins with the raised funds forwarded to the Jamestown-Yorktown Foundation of the Commonwealth of Virginia, the Secretary of the Interior and the Association for Preservation of Virginia Antiquities. Struck from 90% silver, each Old Mint Silver Dollar has a diameter of 1.5 inches. The US Mint released the Proof Old Mint Coin on August 15, 2006. 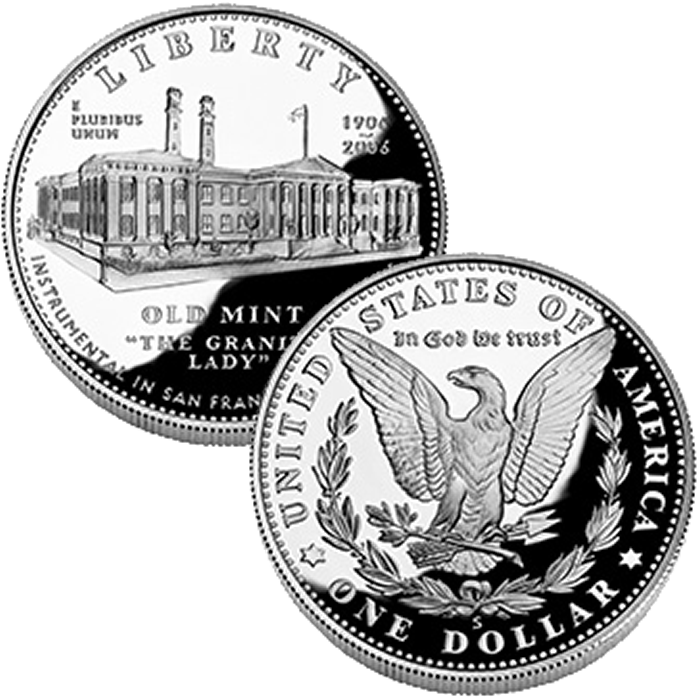 The initial price charged for the Old Mint Proof Coin was $35.00. Each Old Mint Silver Dollar was struck at the US Mint’s facility in San Francisco and carries the ‘S’ mintmark. Sherl J. Winter designed a medal showing the San Francisco Old Mint building and that design was used again on the obverse (heads side) of this silver dollar. The reverse (tails side) of the coin includes a reproduction of the 1904 Morgan Silver Dollar eagle reverse designed by George T. Morgan.